This is part 2 of my Dua Series. Read part 1, Why I Love Dua As A Muslima to see how I implement duas in my daily life. This post contains affiliate links. Do you sometimes wonder why your duas don't get answered? Maybe there’s something more to simply saying dua and hoping for the best. I did some research for my own dua and I discovered that there are ways to get your dua answered more effectively. Firstly, there are situations where your dua is accepted. Secondly, there are times when your dua is accepted. Thirdly, there there are prerequisites for your dua to be accepted. The scholars have mentioned that if you find yourself to be in any of the situations below, it is ideal for your dua to be accepted. A person who has been wronged or oppressed. A person going through a severe difficulty after a calamity. A person who is traveling. A person who is fasting. A person who is reciting or finished reciting the Quran. A person who is performing Hajj or Umrah. A person who makes dua for someone in their absence (when you make dua for someone in their absence, an angel says: “ameen and to you”). A person who is in a state of remembrance of Allah constantly. A person who is a just ruler. All of these times are mentioned by scholars and are in the Sunnah of the Prophet PBUH for the best times when dua is accepted. The early morning hours (the last portion of the night until the start of fajr - divide the night between maghrib and fajr into three parts). During the salah (when a slave is closest to his Lord in a state of prostration or before the end of salah after finishing the tashahhud). A period of time on a Friday (some scholars say it is when the Imam sits down between the two khutbahs, and some say it is the last period of time before Maghrib). When waking up at night, after performing wudu. Before drinking the waters of Zamzam. During the month of Ramadan. During laylat-ul-Qadr (The Night of Decree). At places such as Mecca, Arafat, and Medina (when one goes for hajj or umra). Your income needs to be lawful. Your food must be pure and halal. You must repent for your sins (make tawba). You should remove all the unlawful things from your life. Ensure you are performing the basics: praying five times a day, paying zakat, fasting in Ramadan etc. You should make dua with sincerity and a focused mind and heart. By giving the thing being asked, warding off a harm that would have otherwise afflicted a person, or as gifts awaiting the person in the next life (this is the best form of dua being answered as mentioned in Hadith Ahmed). To perform a good deed before your dua and mention it during your dua (as was done by the three men that were trapped in a cave by a large rock: each of them made dua and mentioned a good deed, and the rock moved a bit with each dua, until they could escape - Sahih Bukhari). To begin and end the dua with praise of Allah SWT. To pray salat-ul Haja (the prayer of need) when possible. Affirming your belief in Allah SWT - Shahadah. Asking Him for forgiveness - Istighfar. Praising Allah SWT - Al-Hamd. Sending blessings on the Prophet PBUH - Salawaat. Say the Shahada - I bear witness that there is no god except Allah Alone without any partner, and I bear witness that Muhammad is His servant and messenger. Say Astaghfirullah x 3 - I seek forgiveness from Allah. Say Alhumdulillah x 3 - praise be to God. Say Subhanallah x 3 glory be to God. Say Allahu Akbar x 3 - God is Great. Say Salallahu Alayhi Wassalam x 3 - peace and blessings upon His Messenger. Call on Allah with yearning, longing, and while being humbled using His Best Name of Al-Hayy (The Ever-Living) Al-Qayyum ( The Self-Sustaining). Express your need of Him and place all of your hope in Him Alone. Tell your Lord that you have no one else to turn to and follow the Sunnah of raising your hands when making dua, ideally while in a state of wudu and facing the qibla. We should not have fear in our hearts that our dua will not being answered due to our shortcomings or feeling like we are not deserving of it. We are told that our “longing” for Allah to answer our dua out of His limitless generosity and mercy should overcome that fear. Calling on Allah SWT for our need is an act of worship, and Allah loves to be called upon. We should be patient and realize that Allah SWT has full knowledge of our problems and is in full control of our circumstances. He will respond to our dua based on what is best for us and in the time that is most appropriate. We must persevere in our dua and not give up if we don’t get an immediate response. When our dua is answered, we should remember that Allah SWT knows what is best for us, even if we may dislike the outcome at first. Allah SWT will only bestow upon us His good pleasure (rida) and divine care (‘inaya), we simply need to ask! In part 3 of my Dua Series, How I Start And End My Day With Dua, I will share my routine of dua in the morning and in the evening. You can also pre-order my ebook "A Muslima’s Book of Personal Duas" with everything laid out in a handy book and includes a compilation of the duas I love as a Muslima, as well as some extras like my personal duas, all in a pretty floral design. This is convenient to read in print form or from your phone each day (as I do). You can also print specific pages from the book and frame your favorites duas to hang on your wall or workstation to remember. Pre-order A "Muslima's Book of Personal Duas here before 02/28/2019 and Save 50%! 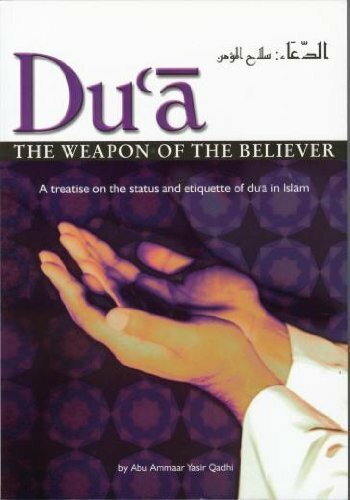 I highly recommend Yasir Qadhi’s Dua - The Weapon of The Believer as a good read to get an in-depth understanding into the benefits of dua.